It's your son's birthday so it's time to get festive with this adorable dog who is clearly having a great time and ready for the celebration to start! This birthday card displays vibrant colors of red and yellow and the artistic Happy Birthday lettering looks excellent! 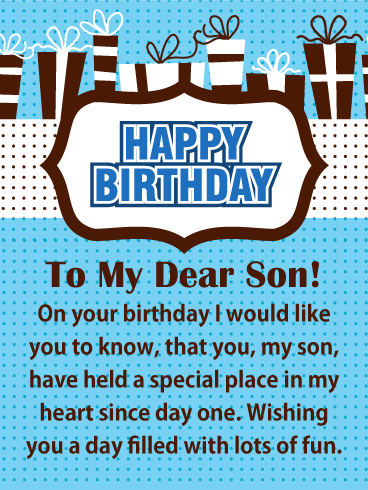 Let your son know you are thinking of him by sending him some joy with this extra fun birthday card today! 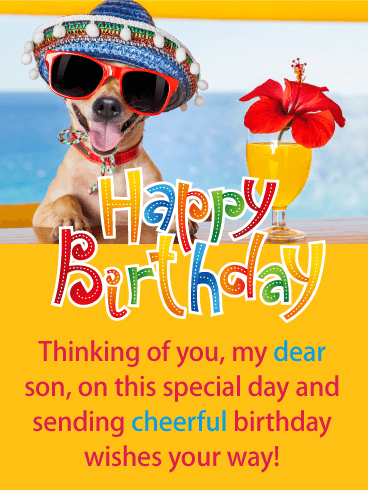 Happy Birthday - Thinking of you, my dear son, on this special day and sending cheerful birthday wishes your way! Special frosted cupcakes, who could ask for a better birthday dessert! This awesome birthday card is filled with festive polka dots and has cupcakes creatively stacked on one another with a lit birthday candle on top! This all makes for a special birthday card that your son is going to really enjoy receiving! 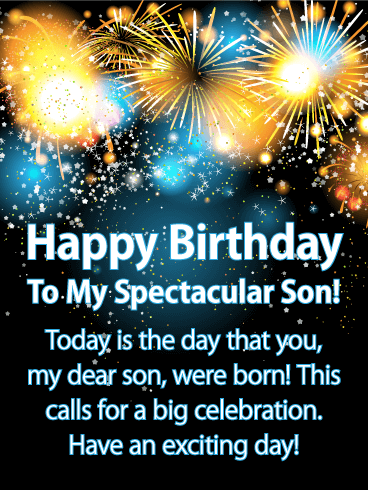 This greeting card will wish your son a spectacular day so be sure to send it to him without delay! Parties are always way more fun with your son around! He knows the best jokes, sings the best songs, knows all the current dance moves, and keeps everybody smiling! Send your awesome son, the life of the party, this happy and bright confetti birthday card! He was probably gonna cut loose and enjoy himself anyway, but he's sure to love knowing he has your support! This perfect cupcake birthday card will put a smile on your son's face for his special day. The frosting with blue sprinkles makes this cupcake irresistible! But the best part of this birthday card is the loving message that expresses that the day your son was born was the happiest day of your life. So special! 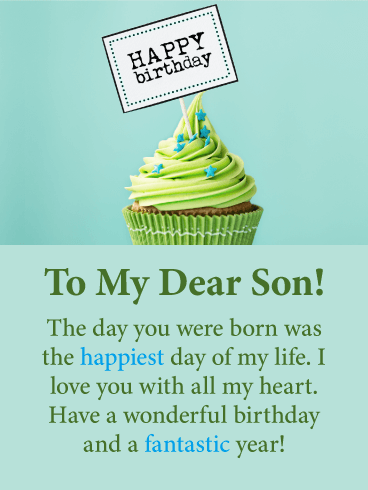 Let your son know how dear he is to you by sending this meaningful birthday card to you him today! 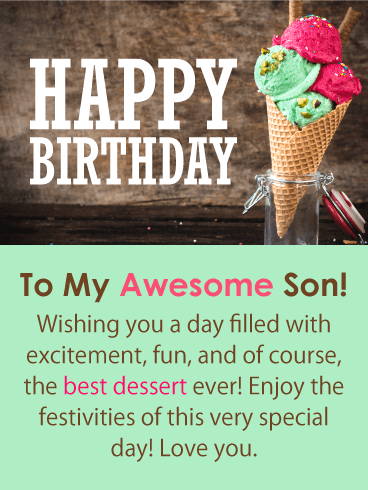 Everyone loves ice cream and that's why you can't go wrong when sending this happy birthday card your son’s way for his special day! It features a cone filled with irresistible colorful ice cream that will have your son looking forward to the dessert he will be receiving in honor of his birthday! 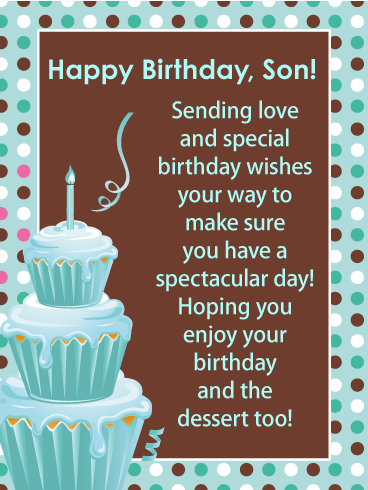 So send your awesome son this yummy dessert-themed birthday card for his big day before it melts! There is no better time then your son's birthday to let him know that he holds a special place in your heart. 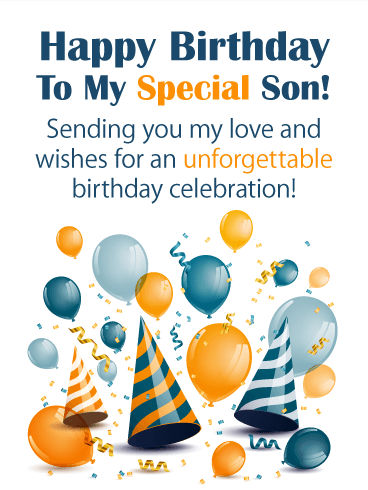 There is also no better way to tell him than with this special birthday card made just for your son! This greeting card was designed with wonderful colors of blue, white, and brown and features gift boxes that add a festive look to this birthday card! Your son is going to love it! 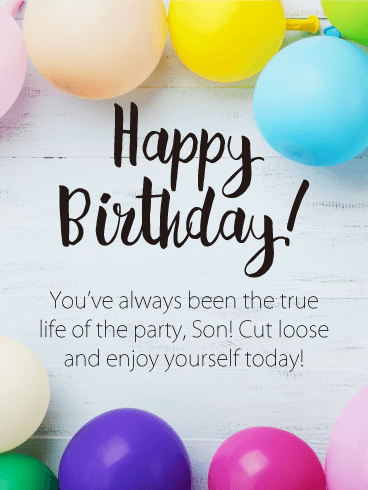 Are you looking for a fun birthday card to send to your son? Then look no further because he is going to love this greeting card! It features a perfectly frosted birthday cake with decorative candles and the words Happy Birthday creatively displayed. This birthday card will remind your son that this day only comes but once a year, so he should make it a special one! Send this birthday card to your son now so he can enjoy this fantastic birthday cake! Send lots of excitement to your son to help celebrate the day he was born with this exceptional birthday card! Yellow and blue fireworks bursting in the sky is a spectacular sight to see and your son will appreciate that you sent such a great birthday card his way! What makes this greeting card so wonderful is that it expresses how special this day is to you. Get the celebration started now by sending these fantastic fireworks to your son soon! Everyone looks forward to opening their birthday presents and this birthday card sets the stage for the excitement it can bring to your son on his special day! This colorful birthday card displays perfect gift boxes and fun Happy Birthday lettering! It also features a message that will touch your son's heart, it tells him that you feel lucky to have such a wonderful son. 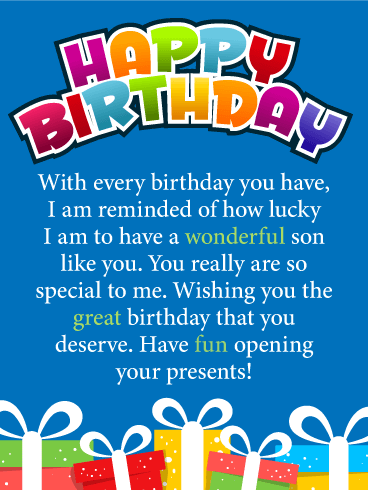 Wish your son a great birthday with this thoughtful greeting card now! One look at these specialty doughnuts and your son will be wishing it was time for his birthday dessert! So as you can see, this birthday card would be a great idea to send, you really can't go wrong with doughnuts that look as good as these! This fabulous birthday card features colors of purple and blue and display stars that make it even more festive! 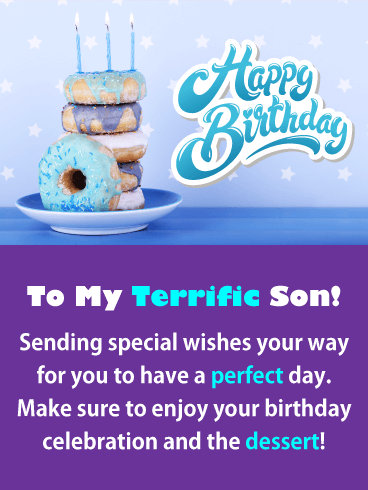 Wish your terrific son a perfect day by sending these birthday doughnuts his way! Boys will be boys, which means going out and celebrating with good friends and a few birthday beers! So send this birthday card to your son today to tell him to have lots of fun with his friends on this special day! 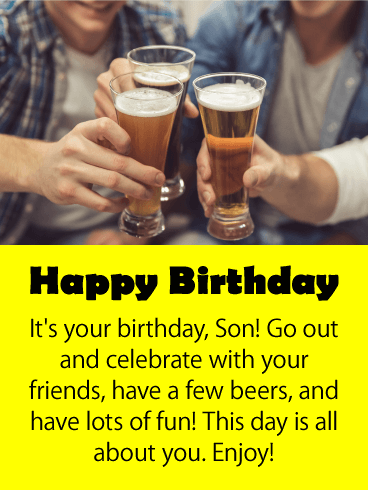 This birthday card captures the essence of good friends and good beer, it will have him looking forward to the great time he is going to have while celebrating! Send a little cheer his way while the beers are still cold! Is your son getting up in age? Wish him a happy birthday and tell him he's never looked better with this retro birthday greeting card! 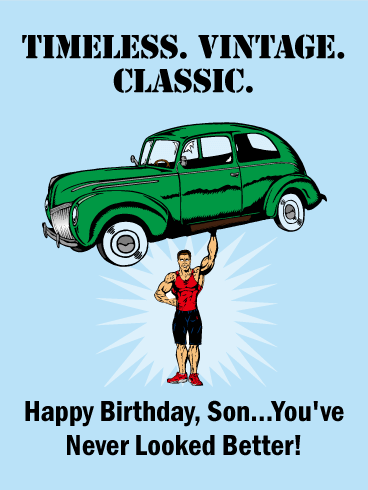 Like a vintage car, your son might be officially over the hill but that's just another way of saying he's a real classic! 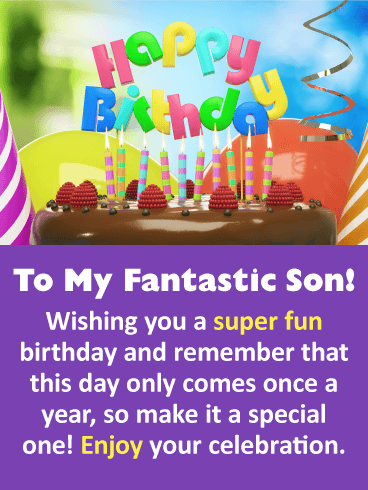 Send a funny birthday card to your son on his special day. Nothing says let's celebrate more than party hats, birthday balloons, and confetti, and this birthday card has plenty of them! These exciting birthday elements are bursting with vibrant colors of orange and blue and will add fun to your son's celebration too! The celebration is about to begin, so be sure to send these special birthday hats over to your son, he might want to wear one on his birthday just for fun!